Continuing in the tradition of "web comics that I like a lot", I really love the 8-Bit Theater web comic, now sadly-but-satisfyingly finished. Created around 8-bit sprites from the Final Fantasy games, the storyline very loosely follows the traditional "save the world" adventure quests with a crew of dysfunctional, immoral, and frequently utterly off-the-rails-wacky four man band. The humor is delightful, especially for classic gamers and D&D aficionado, so it's possible that you may see a theme developing here in terms of my interests. 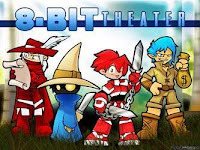 For myself, personally, I enjoyed 8-Bit Theater a lot, and it's definitely a great example of an "anti-protagonist" work where pretty much every one of the good guys is obviously (or, in Fighter's case, potentially) a complete sociopath and yet somehow still thoroughly interesting to watch and sometimes even root for. I keep hoping that Brian Clevinger will publish the comic in eBook format, but until then, we'll always have the web site and various image-to-PDF compiling tools for non-web access. I think you meant the second link to be to the comic, but it's to the same blog post as your first link (the OotS recommendation).